I have created groups using object model in feature activation but was not able to view the groups at the time of adding the user to created groups. Then searching the web come to a web property AssociatedGroups, which add the group to site group. While developing user registration in an sharepoint form authentication site we need to test the user registration process so i have create a small code to delete the user from sharepoint site, member ship provider and sharepoint site if already added. Add the reference to microsoft.sharepoint.dll and Microsoft office server dll. Feature to display a custom link in display page in an content type. Description="This feature is used to add a custom link on display page for content type"
Error:- "Column 'Page Content' does not exist. It may have been deleted by another user." In a scenario I have to write the content in the “page content area” with some formatting. Using UI we can do this very easily by just clicking on “Edit as HTML” link and writing the HTML code in the editor. If you want to have your ribbon button enabled only when user selects some item in the default view of your List/Library, you can do this by getting the client object modal objects of SharePoint. SP.ListOperation.Selection.getSelectedItems() will give you the IDs of the selected items. Another important object is EnabledScript which actually enables/disables the button on returning true/false values. I have created a Feature and written the below XML on the Elements.xml file. LabelText="Click Here To Get Selected IDs"
<!-- This will be an asynchronous operation, that’s why we are creating two delegates for this - onSuccessMethod , onFailureMethod --> <CustomAction Id="CustomUIActions.PageComponent.Command.DoAction"
In this article we will see how we can create managed path in Sharepoint 2010. Sometimes we have to define which URL's SharePoint should maintain for a sitecolllection. To define this we have to create managed path for web application. The managed paths are web application specific i.e. the managed path created for one web application will not appear in any other web application. Explicit Inclusion managed path allows us to create a single site collection on that path and Wildcard Inclusion allows us to create multiple site collection on that managed path. Go to Sharepoint 2010 Central Administration and click on Managed Path as shown in below image. 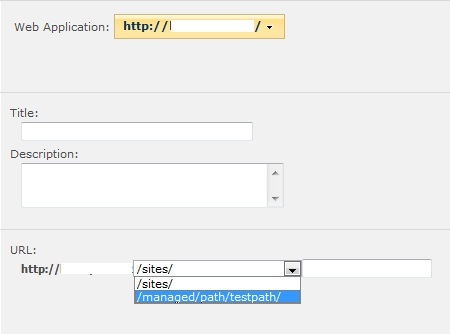 Now write the managed path which you want to create and click on Add Path button. The managed path has been created for that particular web application. Now click on create new site collection and select the same web application you will see the managed path created by you.